The shock of going down to Bayern by 4 goals last Wednesday is a loss that many Gooners are still trying to come to terms. None of this grieving is helped by the sensationalist mainstream media and the army of trolls from other clubs who are doing their best to pour scorn and contempt on The Arsenal. They reported that Ian Wright posted his frustrations on social media and declared he was “not watching anymore”. That was before resorting to one the usual tricks of the mainstream media, i.e. giving credibility to a piece of fake news. They repeated a totally debunked story from prior week, when Wright reported Wenger did not expect to stay on next season. Wenger himself denied making any such disclosure. “I wouldn’t be at all surprised that Arsene now, with the amount of headlines that are coming his way, will look at that and say ‘two decades’. As for the print media, the Times’ chief football writer Henry Winter described the Gunners as a “laughing stock”, adding that he felt Wenger’s best days are behind him. Among trolls from opposition teams, former Manchester United defender Rio Ferdinand said Arsenal showed no fight or aggression. By the way don’t remind Ferdinand that United did not qualify for this year’s Champions League and in the past his club has tasted some heavy defeats. Losing 1-0 to the mighty Lille, 3-1 to Gothenburg, 0-4 to Barca all in the group stages match, and 30 years before that went down 0-5 to Sporting Lisbon in a UEFA Cup Winners’ Cup quarter-final second leg on March 18, 1964. Facts can be very harsh especially to a blowhard with no historical perspective. As readers of my data-driven blogs are aware, none of this over-reaction by the media and by our fans is surprising. As I have shared from the literature on investor psychology this is typical of media and public attitude to the stock market. The media had a commercial interest in hyping Arsenal’s prospects before the game. From what I read and saw, Bayern v Arsenal was going to be the biggest sporting event on the day’s calendar. From my little knowledge of the English media it would have been the lead story in every newspaper and endlessly promoted by BT Sport who were televising the game. Millions of pounds of advertising revenue and media tie-in were on the line especially if Arsenal was to come out of Bavaria with fighting chance to win the return leg. “Arsene Wenger doesn’t deserve that, obviously the Arsenal fans are disappointed, but to pre-empt by bringing a banner into the ground, it’s a joke. One is left to wonder which sections of the Arsenal support Mr. Winter is plugged into as the latest poll I am aware of shows over 53% of Arsenal fans want Wenger to remain and furthermore no fan has the right to protest within any stadium. By paying a ticket they have the right to a seat to watch a game but not to protest, in the same way readers of the Times have no right to protest within pages of the paper any b.s. written by Winter et al. But I digress. The media’s “confidence” that Arsenal may progress has turned to contempt. A similar negative sentiment has swept the fanbase with feelings ranging the gamut; indifference, dismissal, denial, fear and panic. It called time on some of the players involved. And I think it has called time on Arsene Wenger’s Arsenal career. If I had the power, when Arsene retires, I would call time on Arseblog’s career as a blogger as he owes his entire being to the success Arsene Wenger has brought to the club including 20 years of consistently qualifying for the champions league. Without this success the Sage of Dublin would never have the size audience he now has to spew shite on the man who is the primary reason he became one of the biggest bloggers in English football. Now he can leverage that audience commercially; the media gigs and tie-ins with razor vendors, fantasy football, gambling sites etc. What a beautiful life. When promoting the end of Arsene Wenger he should look with fear and trepidation at the plight of United bloggers who, because their club’s fortunes have dipped precipitously since Ferguson retired, have no way of keeping up with his commercial success. The Sage of Dublin can at least argue he supports one of the consistently top-3 clubs in England. “Let’s pull no punches we have not been in the best form of late. As ever injuries and international duties have created instability at the heart of the midfield, these, combined with Xhaka’s suspensions are, I would hazard, at the root of our problems. We have, in spite of these issues, managed to grind out enough results to keep us in contention but against the real form team were found wanting. Based on Stew’s analysis, we went into the game as underdogs and we got whupped as underdogs. Nothing changed statistically. My only difference with Stew and others is that without Santi Cazorla, our chances of beating Bayern were slim and none and, in hindsight, slim did not take the Arsenal jet to Germany. I have done the research showing that historically Santi is our most valuable player, “quarterbacking” our midfield from deep. Seven (7) PL games this season with Santi, AFC’s ppg was 2.7; nine (9) games without him it fell to 1.3. There have been nine (9) more games since then and I suspect our ppg is just as bad if not worse (need to update). In his four years with the club, with Santi the average ppg is 2.09 but for Arsenal overall (accounting for games without him) the ppg was 1.92.The average PL winner in those years averaged a 2.26 ppg. Simply put, without Santi’s assists Arsenal has never been in contention for the title. In preparation for this blog, I researched the Squawka data for AFC’s midfielders this season and by far the two best midfielders are Ozil and Santi based on Avg Performance Score. The difference between Santi and 3rd place Iwobi may be 2 points but there is a huge gap offensively; in Shot accuracy, Avg Pass Accuracy, Avg Chance Created, and Avg Goals Scored. One day I will publish the rest of my findings. Readers may be shocked by the ranking of the remaining midfield players from 1 to 8. The data is clear and consistent. Until the club’s technical leader returns from injury AFC will struggle to play effective, offensive football. In my judgment, the biggest blow suffered in Bayern was our confidence. As Arsene often reminds us confidence is very fragile; quick to go, slow to rebuild. I am confident the manager will help the team rebuild this confidence despite current doubt, suspicion and caution. It is an eternal cycle; always was and always will be. Manchester United named the most expensive substitutes bench in the history of the FA Cup when they faced Blackburn Rovers in the fifth round of the competition today.. The total cost to United of the seven players on the bench at Ewood Park was £192.5 million, with those in question having commanded a cumulative fee of £357.8 million in total throughout their careers, as reported by the Daily Mail. I’ll avoid the comments until I know today’s results (Hoping for draws). They players have to stand up and be counted from here on in, starting tomorrow, no more stupid defensive relapses early in the game, with all due respect, it is Sutton we are playing. I had a feeling we would get Lincoln! We just have to get past Sutton first with everyone, including a sizeable amount of so called Arsenal fans rooting for them. Arsenal had a scouting team at the PSG V Toulouse game this evening, the focus of their attention was the Toulouse goalkeeper Alban Lafonte, he only last month turned 18, but has been Toulouse’s first choice keeper for a year now. He is the youngest goalie to play in Lique 1. He was born in Bukina Faso but is a French U18 International. That really is incredible Ed……shades of the Owen Coyle times. Duchess team were knocked out of the FA Cup by Lincoln…..he is hailed by that publication …a genius…..Wenger and arsenal will be knocked out of the champions league by Bayern Munich, and Wenger is the worst manager that ever existed. 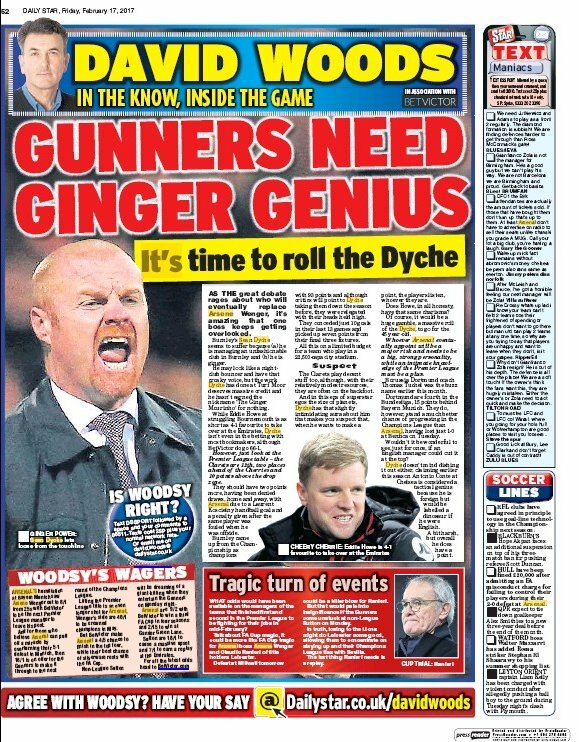 But having said that, perhaps if arsenal are knocked out of the cup by Lincoln, and finish lower mid table, Wenger will then be a genius like Dyche? This is such a good article. I think it’s important to point out what the expert plundits are saying vs Steww’s preview (and rare, similar articles elsewhere). Ta for posting the Times article. I’m amused that Liddle’s piece counts as positive. It’s a bit like G Neville – once in awhile he says something positive about Arsenal (and I’ll take it every time), but once back to whomevers agenda – it’ll be back to ‘you know what’. The main thing being to ultimately diss Arsenal. I found arseblog, yellow ribbon, 7 am, etc, at the same time as UA. I had to give up on all but UA once I realised they ignored the various bias heaped upon Arsenal. I was shocked and upset that following Ramsey’s injury at Stoke, which they reported on ‘reasonably’, they appeared to realise that their bread was better buttered if they followed the narrative. Very poor, I say. I think they’re nicking a living along with the plundits ilk (icity). Whats the fuss about conceding goals? I think kos mustafi pairing has been remarkable.I think we lost only twice when both were playing (Chelsea and Watford). Correct me if i am wrong. Our losses this year to Liverpool City and Everton hapoened when kos and Mustafi did not played together. Even at Bayern we were equal when the pair was on the field. Goals conceeded will surely coincide with the presence or absence of certain pairings. Sorry Shotts late to the party!